. :: Northwest Indiana Genealogical Society ::. 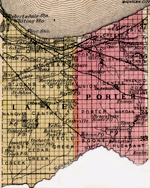 Welcome to the website for the Northwest Indiana Genealogical Society! We are glad you are here. We are an active society that is committed to preserving the history of Lake County and Porter County in Indiana. We have some great resources for you in your research. Many dedicated volunteers have made these available to you. If you are local, we encourage you to attend one of our monthly meetings. You can contact us directly at nwigs@hotmail.com. We are looking for someone to fill the office of Second Vice President for 2012-2013. Please consider joining a wonderful group of officers and sharing your time and interest in our organization and in leading NWIGS to a bright future. If you are interested in this position or for more information, please contact President Marlene Poster (at marlenepolster@sbcglobal.net) or any other board member. The Society meets each month from 10:00 a.m. to 11:30 a.m. in either the Valparaiso Branch of the Porter County Public Library or the Lake County Library. Check the schedule below for the location. Saturday, July 21, 2012, at 10:00 a.m.
Michael Lacopo of roots4u.com speaking on "Methods for Identifying German Origins of American Immigrants." Most of us have at least ONE German ancestor - and this presentation will cover 18th, 19th, and 20th century immigrants. Michael will explain how to research, where to research, and you should leave knowing where to search next for your ancestor. This meeting will be held at the Valparaiso Branch of the Porter County Public Library. Saturday, August 18, 2012, at 10:00 a.m.
Jennifer Holik-Urban will teach us how to find the history of our home and what the land was used for. The meeting will be held at the Dyer-Schererville library. Consider joining the list to keep informed about upcoming events, post queries, and to communicate with our members. or test.